Thelma Harper may have a temper, but elderly people are always cranky. And as much as I hate to say this, that's going to be us years from now, so we just have to deal with it. What I love about this show is that it has a close-to-home feel. It's set in the midwest, but it has southern vibes too. The seasons where Bubba joined the cast will always be my favorite. The King of Queens was so good it was in a class by itself. Kevin James co-created a comedy classic that spent many years as my favorite comedy. 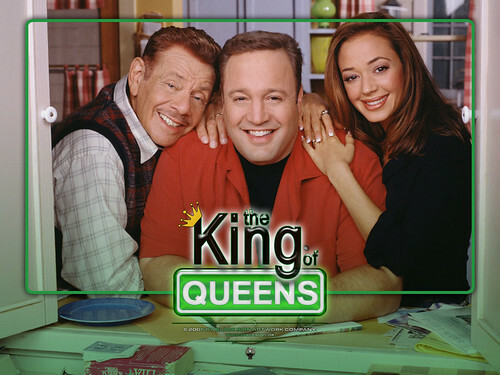 After almost a ten year run, The King of Queens ended at the high point of its popularity. The magic is simple, a very funny cast. This show has no weak characters and many of the situations are so basic it makes you laugh at yourself for finding it so funny! Now everyone's crazy over Jerry Stiller as Arthur, but watch how Kevin James really takes this scene over the top. I die laughing because the entire series is made up of small scenes that can stand on their own and help make the show so enjoyable. And don't get me started on Leah Remini as Carrie. I just love it every time she and Jerry Stiller got into it over one dumb idea after another. All good things must come to an end, but television will never be so much fun now that The King of Queens has passed into syndication heaven and dvd immortality. For fans of British sitcoms I have an old favorite from the 90's. "The Thin Blue Line" is a 1996 BBC comedy starring Rowan Atkinson as the Chief of a dysfunctional suburban Police Station just outside of London. This is one of a series of Britcoms the Seattle PBS station aired latenights on weekends. If you've never seen this before, give it a go. Next to Blackadder this is Rowan's best speaking role. @eddstarr: Yeah, Arthur Spooner was a hilarious character. He's in my top 10 favorite tv show characters of all time. And everyone else was great on The king of queens too like you said. These clips are all over YouTube Jrs1991, What A Great Show. And the best part, every season was a winner. They don't make comedy better than this! Sam & Cat (and Victorious too) has become one of my favorite sitcoms and tv shows in general. The character "Cat Valentine" is now in my top ten favorite tv show characters. And not just because it's ariana grande, she was the reason i gave both shows a chance and ended up really liking them. I like the character because she's an innocent goofball like ernest, pee wee herman, spongebob or kel. I've got two words to say to you: "TACOS . . . YEA! ".